A few years ago I built a peanut feeder. It was mainly built by trial and error. I am still changing the design. I closed the hole on the side. The only way the birds can get peanuts is from the bottom. I thought that having the access hole on the bottom would deter the sparrows and other undesirables. Alas, it was not to be. The blue jays learned to fly to a shrub about twelve feet away and use it as an airstrip. They take off and fly to the hole and quickly grab a peanut before they lose altitude. The Grackles stab into the hole and poke at the peanuts. They quickly drop to the ground and grab the peanuts before other birds can eat it. The sparrows, oh, those sparrows. Never mind, let’s not think about sparrows. 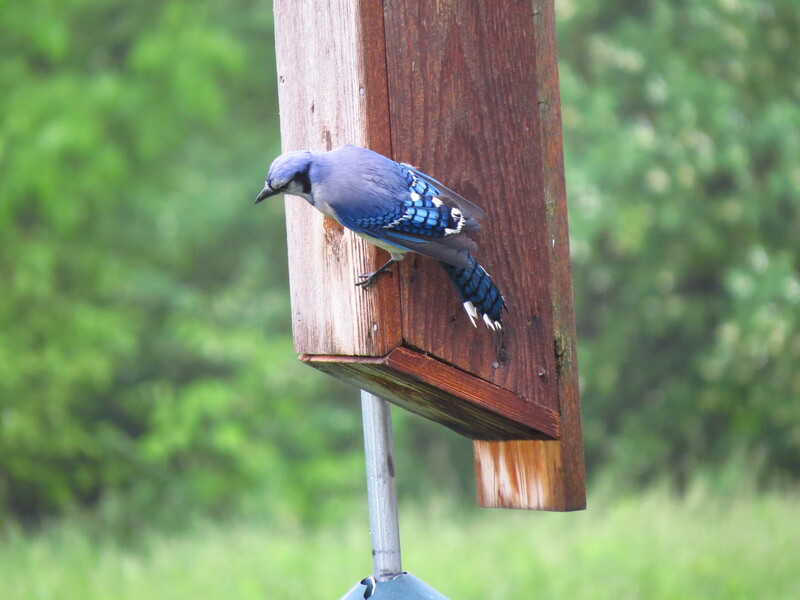 This blue jay has pretty much learned the ropes. A Red-bellied Woodpecker enjoys his meal. 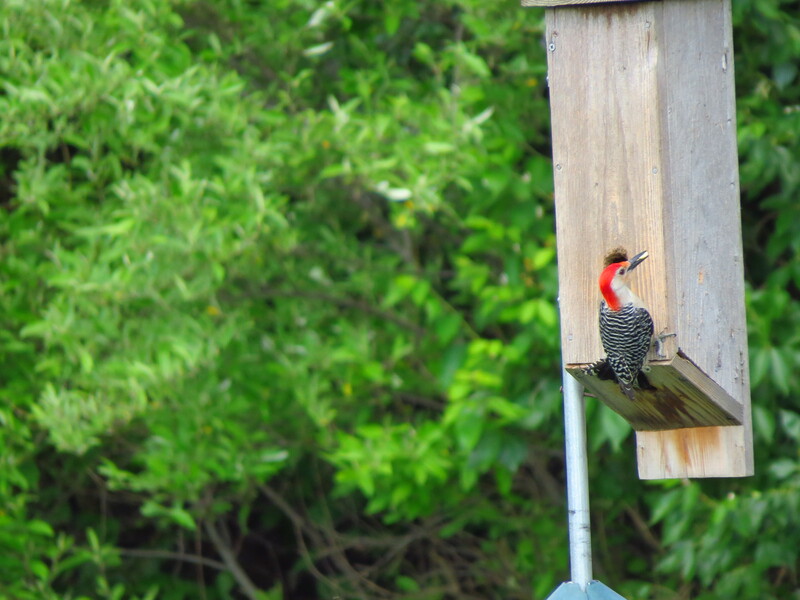 Most of the woodpeckers that feed at the feeder are red headed woodpeckers. 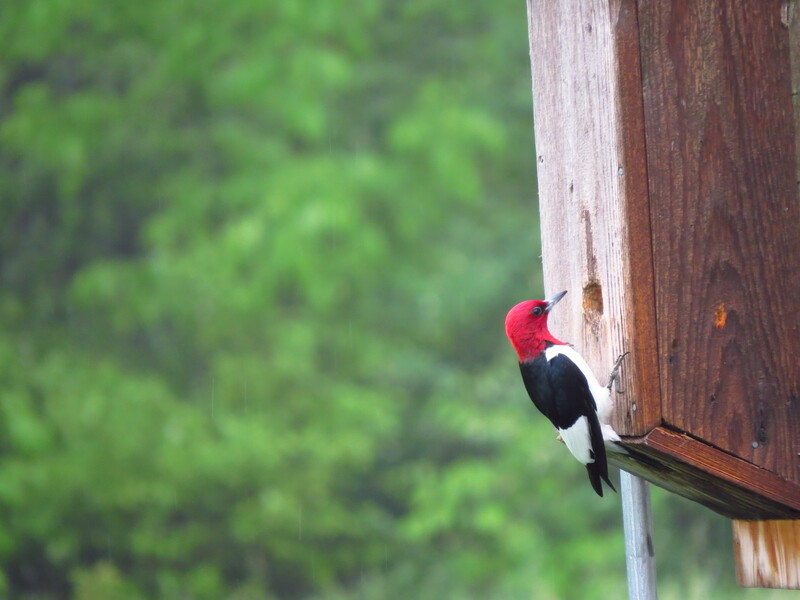 One morning a red headed woodpecker was sitting on top of the feeder making a huge fuss. Finally my wife asked if the feeder was empty. I knew it was, but I was out of peanuts at the time. The woodpecker continued fussing. The next morning he sat on the feeder again and continued scolding me for my carelessness. Finally I bought peanuts and filled the feeder. All was well. The woodpecker was happy. About a week later one morning I was sitting by a window in the sunroom when I heard what sounded like a jackhammer on the roof. I ignored the sound, but every so often the jackhammer pummeled the roof. Finally after a really loud drumming right above me I looked up. There was the woodpecker hanging from the gutter glaring at me. When I looked up he flew off. I knew that the feeder was empty again. That was weird. How did he know to come to me to have the feeder filled! I am amazed time and again how smart the animal kingdom is.